Long ago in a galaxy not so far away, George Lucas made movie history. He blended archetypes of legends and visionary cinema to revolutionize the film industry. 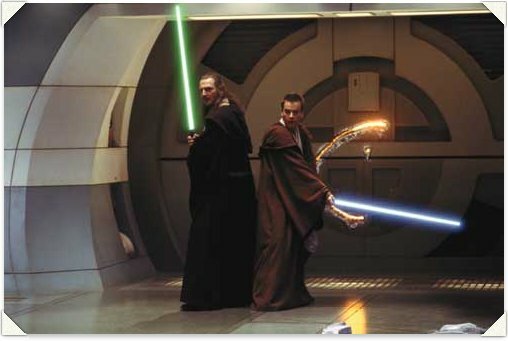 The Star Wars films effectively demonstrate the movement of the hero’s journey and show a clear and simple path through the many archetypes the hero encounters. Using the model from Joseph Campbell’s teachings, George Lucas was able to create an entire universe of metaphors, symbols, and myths that express how we feel about good and evil, technology and faith. Campbell defined the Hero Cycle, a course of events that occurs as a rite of initiation in every myth, pinpointing the need for mentors, villains, elixirs, and jesters along the way. Each step can be traced in the adventures of Star Wars. The Star Wars Saga contains the same mythic structure that the ancient storytellers used to fuel imaginations throughout the ages. To follow this billion dollar formula the main character in your story will need to encounter tests, trials, ordeals, joys, and rewards; then meet all of his/hers shadows, mentors, shapeshifters and threshold guardians. These charts are each a full color-coded layout of the episode. It includes a detailed scene breakdown description for each act. It includes the hero’s journey model and how it specifically relates to the main character in this episode. 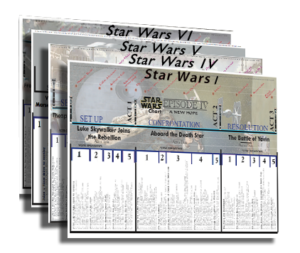 The back of the chart includes a complete description of the film in perfect detail: The Introduction crawl, story synopsis, and the breakdown of each scene on the front of the chart in even more detail. Star Wars is a timeless story grounded in mythology like stories from our childhood that draw us in, leave us full of awe and wonder, and compel us to return. The Star wars Saga appeals to the human psyche on all levels which has made it one of the most enduring stories of modern times.